Want to become a better time manager? Want to become more productive? Want to be the boss of your day? If you do then quit multitasking and start focusing. 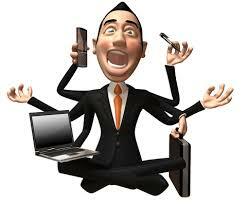 Just read a great article that suggests that multitasking is out and focus is in. I encourage you to underestimate what you can accomplish — it will still be a lot — and be pleasantly surprised at the end of the day at how much you get done. Second, be selective in responding to what you perceive as crises. Fourth, if you work with a team, delegate as much as possible to reduce the pile of work on your desk. The article also provides ways to maximize your focus. If you want to read more from this Huffington Post article then read it here.